Ideal for freestanding and hanging signs, KAPA line is a light weight board with a foamed centre but more rigid than foam board. 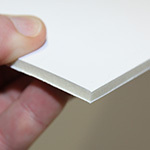 The foam centre is not pure white but a yellowish off-white which is visible on the cut edges. KAPA line is a card-faced board so is not water resistant and should be used indoor only.